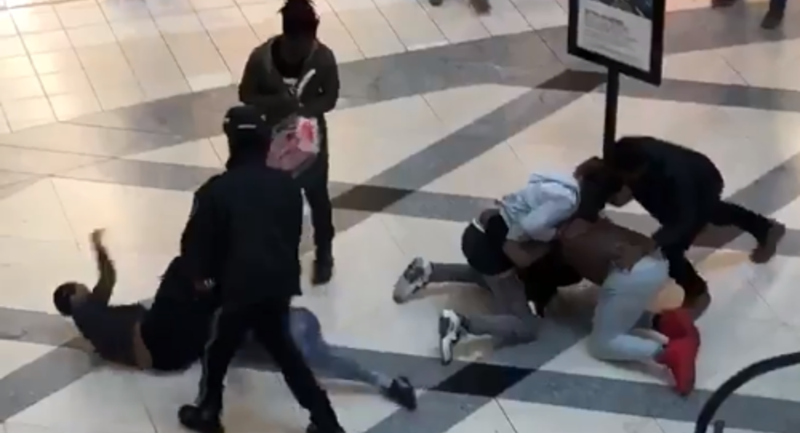 On Sunday, a fight involving five people broke out at a mall in Atlanta, Georgia. Footage of the melee has since taken flight on social media. Gaining more than 1,000 shares on Twitter, footage of the altercation shows three men and two women tossing punches and pulling hair as bystanders look on in shock. According to WXIA, those involved include Demontez Cole, Jason McCray, Ashanti Tucker, Lashayla Perryman and an unidentified man. ​The brawl was ultimately shut down by mall security. Cole told officials that the fight was reportedly triggered by an ongoing dispute between his girlfriend, Perryman, and Tucker. "My girlfriend and her were beefing," he told police, adding that the exchange of blows began after he and Perryman ran into Tucker and McCray outside a North Face store. Once Tucker and Perryman began throwing punches, Cole, McCray and the unidentified man started their own. McCray told officials that he'd "picked up [Cole] and slammed him" before Cole and the unidentified man managed to "jump" him. Although Perryman managed to get away from the ordeal with Tucker's phone in hand, McCray, Tucker and Cole wound up being taken into custody. They were later cited for disorderly conduct.